University life is full of daily obstacles that can interfere with our mood and wellbeing. The accumulation of certain events can lead to many students’ studies being interrupted by depression and/or anxiety as motivation and decision-making becomes more difficult. Such issues are common but also difficult to overcome. However, the Counselling, Health and Wellbeing Service are introducing an exercise referral programme in order to provide a helping hand to students at Cardiff Uni. What is Exercise on Referral? Exercise on Referral is a new scheme involving collaboration between Counselling, Health and Wellbeing from Student Support and Sport. Exercise on Referral is a fairly old concept, and works on the idea that exercise and physical activity is good for health and wellbeing, and also the prevention of long-term medical conditions. There is scientific research that suggests people who engage in physical activity are more likely to report better mental health, suggesting that there is a positive relationship between physical activity and general mental health (Kim et al, 2012). What can I expect if I am referred onto the scheme? The scheme is fully funded and involves 8 weeks of one-to-one support with Richard Jones or another member of the Sport team. Your activity levels will be assessed before a personal programme is devised, based on activities of your choice. The programme will not necessarily be gym based if this is not something you enjoy, it could involve a more walking featured programme, or even a home exercise DVD. You will have regular check-ups with Richard to monitor progress and motivation. If you are not already a member of the gym, you will be given access to use the gym free of charge for the duration of the programme. If you wish to continue using the gym after the programme, you would need to purchase a membership. Additionally, if you already are a member of the gym, you can still be referred for an assessment and guidance from Sport. How do I refer onto the scheme? A member of the Counselling, Health and Wellbeing staff must refer you for the scheme. If you think you would benefit from this programme, you can drop in Monday-Friday 3-3:45pm for a non-bookable, 10-15 minute appointment to have an initial chat with us or, alternatively, please refer into our service by completing our referral questionnaire. Please be sure to mention that you are interested in the scheme and would like to be considered. 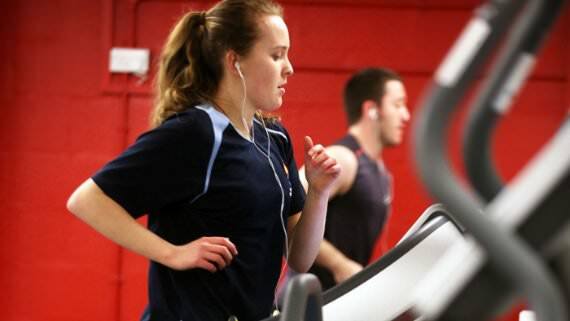 More information about Sport and Exercise at Cardiff University. Will and Annie, Student Interns.